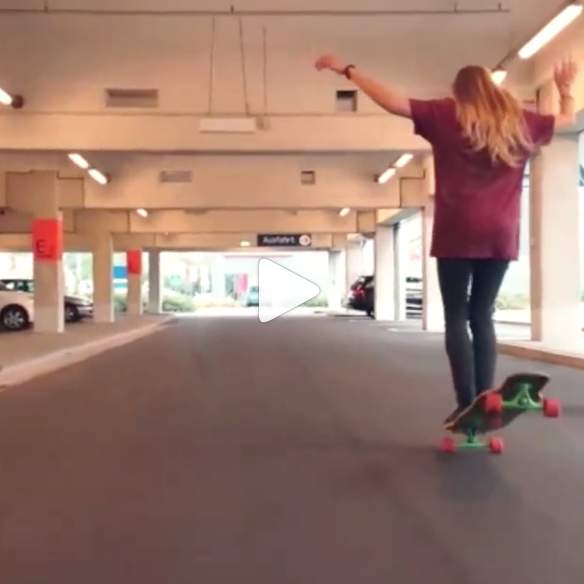 Cinalufran shares this photo from her skate video down the streets in Zug, Switzerland. Now that I know about Zug – I’ll definitely add it as a place I’d love to skate. Where are you skating? More girls skate as they see girls skate – make me want to do a travel show on skate holidays. I find it so inspiring when girls from around the world share their pictures – I just know more girls skate when they see girls skate. 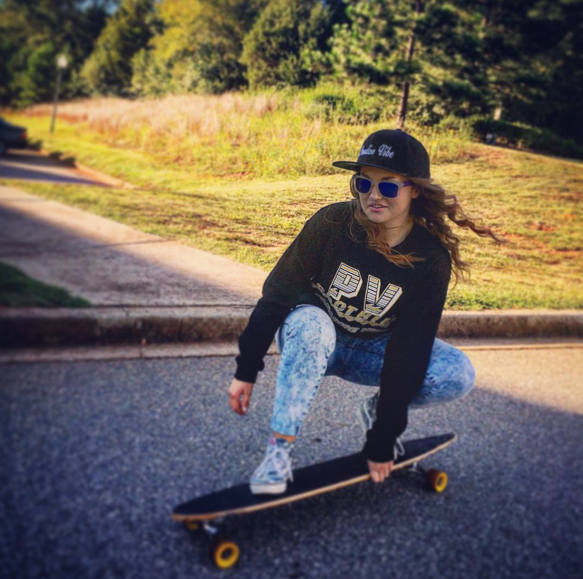 This is Megzi aka meggggomyeggo skating with style in Clemson South Carolina. She’s also a student at Clemson University – girls really can multi task! Petra_surf is showing us some serious air in Austria – at the Cradle Skatepark – Austrian Bowl Masters 2015. 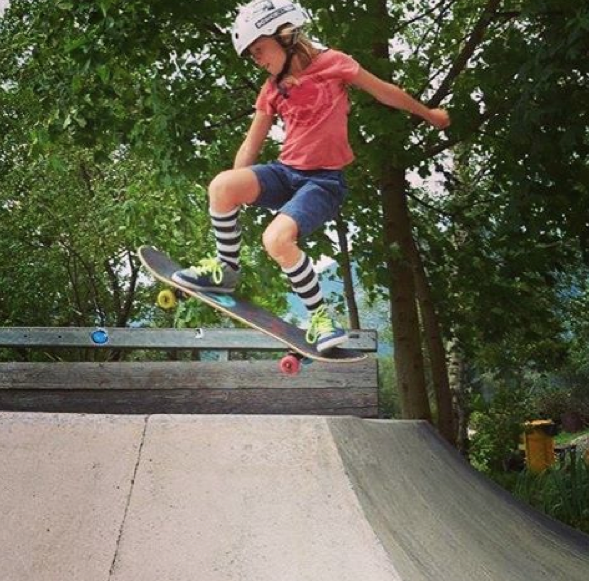 The Austrian Bowl Masters Championship held their 9th Bowl Contest on 8/8/15 at The Cradle Skatepark for under 16, women, and over 16/sponsored. I don’t know about you – but I’m thinking it would be nice to go the 10th. 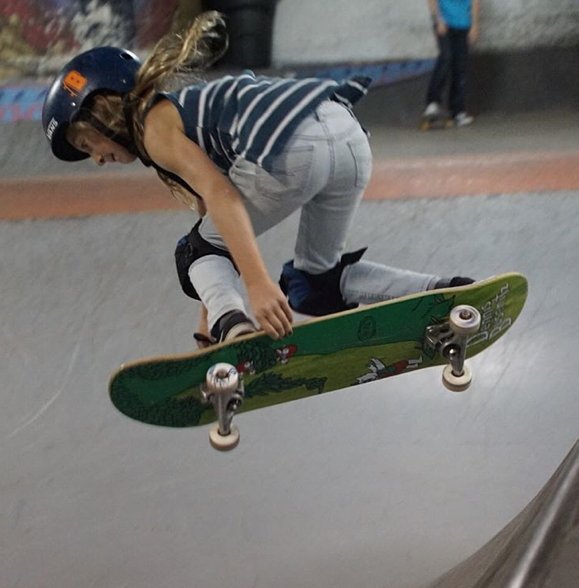 I love finding out about more events that support girls skateboarding. One girl is strong – many girls working together are unstoppable. Went to EXPOSURE Skate 2015 yesterday- my report on that coming soon! Even if I did NOT skateboard, I would still love the Element Eden collection. From their graphic tees – many of which inspire the wearer to embark on the next adventure – to their dresses which easily move from daytime casual to nighttime chic – I love their designs. I read more about Element Eden – which I do for all organizations I’m interested in. I want to know what the organizations I support stand for & believe in. I found out about their team of advocates. Their advocates are women who turns dreams into reality. In 1999, Kori Schillereff turned her design dreams into action by creating the first legitimate girls clothing line in skateboarding. Today Element Eden is one of the leading women’s youth lifestyle brands. They have a goal of creating message and product that make a difference in our world. When I reached out to Kori to invite her to EXPOSURE Skate, the non-profit that originally inspired me on my mission to get more girls skateboarding for fun and keeping it fashionable, she immediately responded with a fabulous and priceless donation. After the Fourth Annual EXPOSURE event on 11/7 in Encinitas, CA – the world will be able to bid on an incredible deck donated by Element Eden. 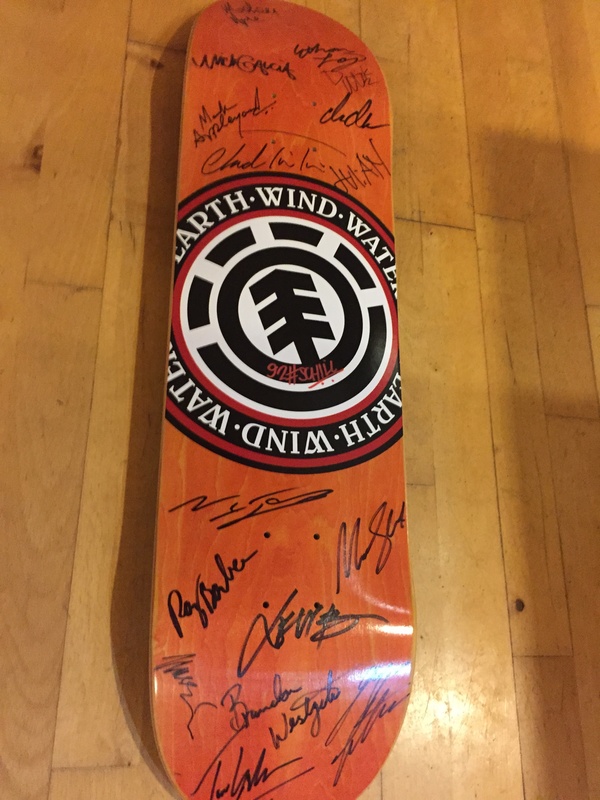 The deck is signed by the entire Element Skateboard Team. I’m excited to share a sneak peak of the board that will be on the EXPOSURE Skate on-line auction after 11/8. Proceeds from the on-line auction benefit victims of domestic violence . 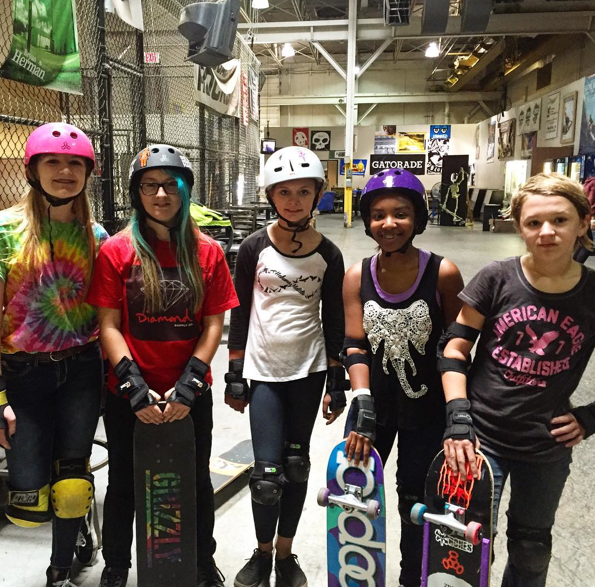 Thank you Element Eden for believing girls can skateboard and keep it fashionable. To see Deborah_keser hanging on 10 to 5 to shove-it watch the video – love it. Deborah is a team rider and if you check out her IG you’ll know why. 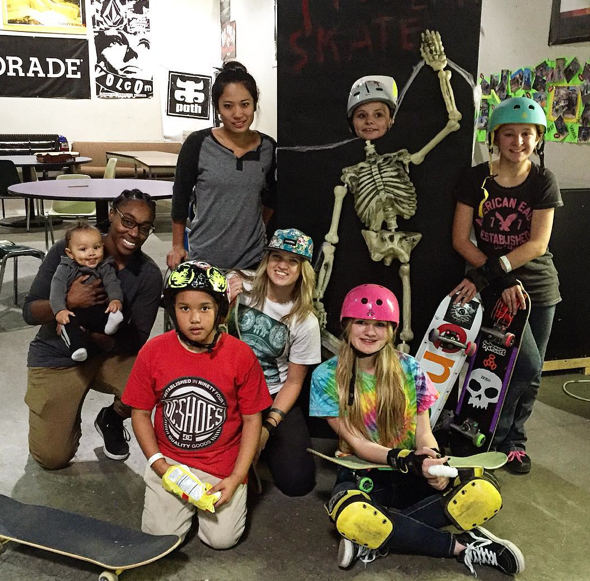 Where are you skateboarding – take time to share like Deborah did – it inspires all of us! More girls skateboard when they see stylish girls skateboarding! Post it up spread the word! Girls Shred too!! I absolutely love spreading the word & sharing the pictures – seeing is believing & more girls do skateboard as they see other girls skateboarding and having fun. We are all stronger people when we encourage each other. These girls are shredding at Modern Skate & Surf Royal Oak Michigan! at a #grogirls #grogirlsmichigan event – if you haven’t checked out GRO – Girls Riders Organization – you should – they are all about getting girls like these rad ones in Michigan together to skateboard for fun. Skateboarding is fun & it’s even more fun with friends. Love the style I’m seeing here – can’t wait to see more from these Michigan Skater Girls. My mom’s from Michigan – maybe it’s time I skate the “homeland”! POM POM is a rad brand started by Sarah Cameron a skater, snowboarder, surfer who’s on a mission to inspire others to try something new, live for recess and to always #RIDE WITH YOUR FRIENDS! 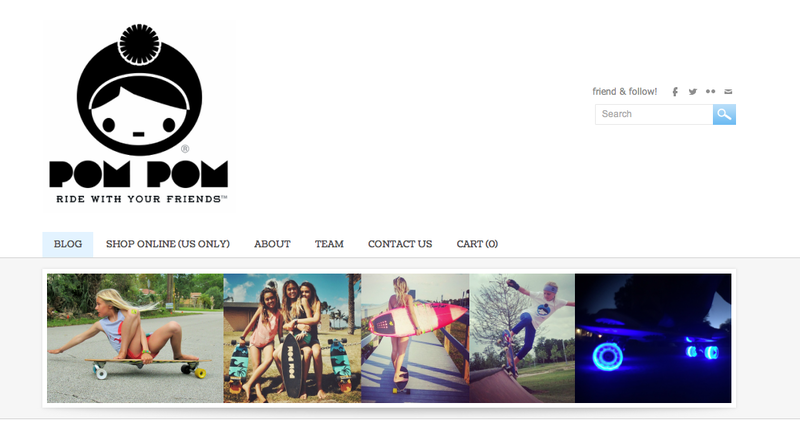 From the beginning POM POM’s mission was to encourage equal participation in the male-dominated action-sports industry. 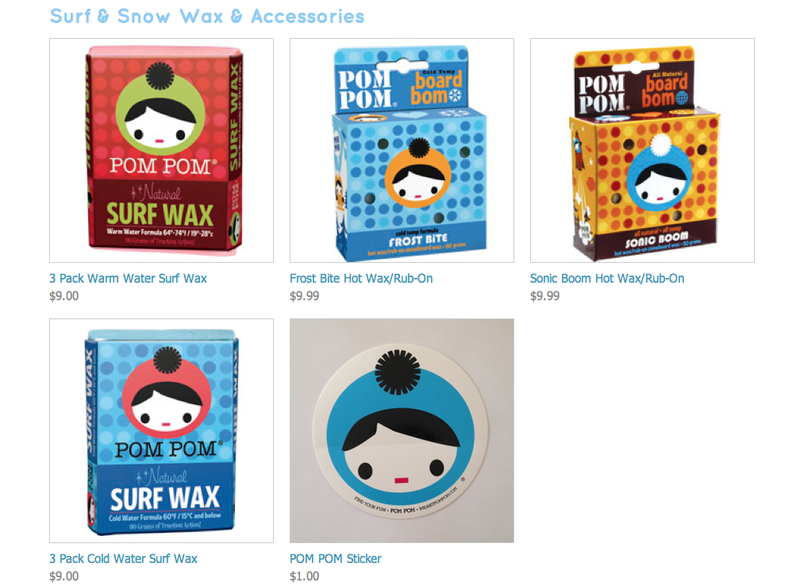 As a result, POM POM was the first snow, surf, and skate wax brand that put special focus on products and marketing for girls athletes. Because POM POM was the first wax brand focusing on girls, they received a lot of press and attracted some of the best female athlete in the world to the POM POM team. 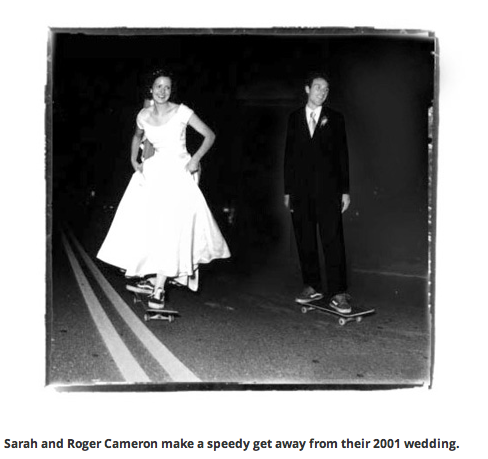 Let it be known though that Sarah is helped by her partner in skateboarding & life – Roger. Remember it’s about riding with your friends. SF: Was this the original line of products and what year did you start selling? Can you share details on where the “home office” is and where people can shop for Pom Pom? Sarah: POM POM first started making skate wax and we made it right in our kitchen! We first started selling in 2008. Our “home office” is literally our home but we have dreams of building an office in an old barn someday. People can shop for POM POM at our online shop at www.iheartpompom.com and also tell your local shop to carry POM POM! SF: When did you expand to longboards? 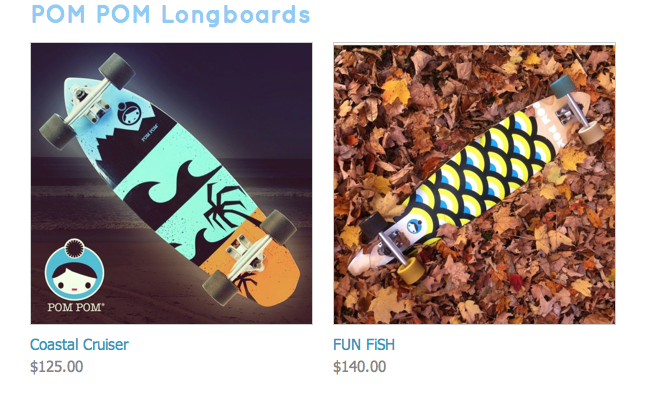 Sarah: We just recently launched the longboards this year and are really excited for the upcoming line of POPSTiCKS (mini cruiser boards) as well as the POPSTiCK Plus line coming out in the spring. SF: And the incredible POPSTiCKS– how did that come about? And when are they available? Sarah: My husband (Roger) and I developed this line of boards together. We wanted to create a fun board to cruise on but one that you could also easily ollie on as well. We went through a lot of R&D on this board to make sure the shape was right. The POPSTiCKS will be available this November and we have a line of POPSTiCK PLUS boards coming in the spring which are based on the same shape, but 30% bigger. All the boards come with light up LED wheels which make the experience even that much more FUN! SF: What can you tell us about the Pom Pom Squad? What are the common characteristics of Pom Pom Riders? Can girls & boys apply – if so how? Should they tag you on IG or email you or ??? Sarah: We are very fortunate to have an amazing team of riders on the team. To be on the team, it takes more than skill—we look for a great, positive attitude and someone who naturally inspires and motivates others. Our team right now is comprised mostly of girls, but we are honored to have Scott Stevens and Chris Beresford (founder of DANG Shades) as supporters of POM POM. POM POM isn’t about being ‘girls only,’ it’s about promoting equal participation in action sports. Scott and Chris back that mission, which is great for girls. Because we are small, we do need to keep the team small so that we can manage it and give our athletes the attention they deserve. SF: I’m going to be participating in the #ridewithyourfriends campaign can you explain that and how others can get involved? Sarah: We believe that you always have more fun when you #RideWithYourFriends. Friends are there to support, inspire and motivate you to try things that you might not otherwise try. We are super psyched to partner with you and the POMPOMPOPSTiCKS and follow your journey as you #RideWithYourFriends. Anyone can join the campaign! Just get yourself a POM POM POPSTiCK, share your journey, tag @iheartpompom and #RideWithYourFriends. Thanks so much Sarah for your contribution & dedication to girls being active and working together. So glad I met you & look forward to sharing lots of posts about the POPSTiCKS – because you know more girls skateboard when they see girls skating & we encourage each other. 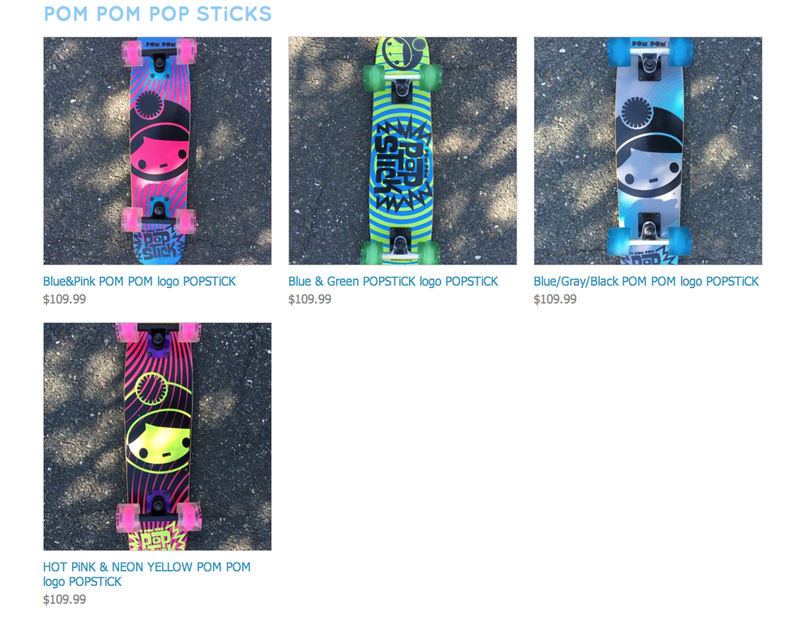 Speaking of encouragement – POM POM is a proud Sponsor of EXPOSURE Skate – several lucky people will be winning their own POPSTiCK on Saturday 11/7/15 in Encinitas, CA – really hope those winners share their travels with both POM POM and us! Birthday & Skateboarding go well together! her sister averysnavely was shredding & celebrating too. Happy Birthday Marley & thanks for letting us know Avery. More girls skateboard when they see girls skateboarding. You never need a legit reason to eat cake – today we have one Marley’s belated birthday! 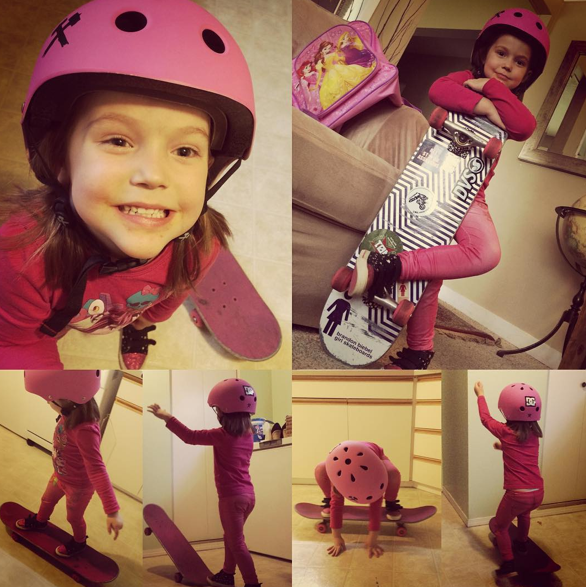 Zombettie_plague shares this collage of her daughter Deegan skateboarding in the kitchen. How refreshing there are definitely too many signs that say NO SKATEBOARDING. Skateboarding is not a crime & I’m thrilled that there are mom’s that allow it in their kitchen! Deegan lives in British Columbia. 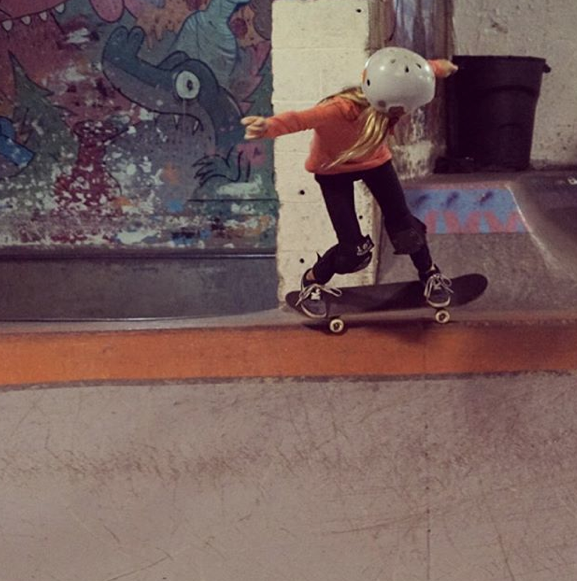 She’s been skateboarding for about a year and is getting ready to turn the big 5. More girls skate as they see girls skateboarding so thanks Deegan & mom for taking the time to share.